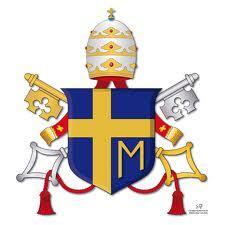 The Rosary, though clearly Marian in character, is at heart a Christo centric prayer. In the sobriety of its elements, it has all the depth of the Gospel message in its entirety, of which it can be said to be a compendium. (2) It is an echo of the prayer of Mary, her perennial Magnificat for the work of the redemptive Incarnation which began in her virginal womb. With the Rosary, the Christian people sits at the school of Mary and is led to contemplate the beauty on the face of Christ and to experience the depths of his love. 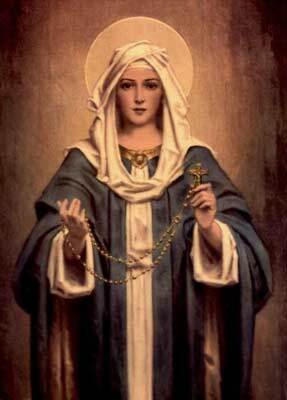 Through the Rosary the faithful receive abundant grace, as though from the very hands of the Mother of the Redeemer. 3. Therefore, in continuity with my reflection in the Apostolic Letter Novo Millenio Ineunte,Novo in which, after the experience of the Jubilee, I invited the people of God to “start afresh from Christ”,(6) I have felt drawn to offer a reflection on the Rosary, as a kind of Marian complement to that Letter and an exhortation to contemplate the face of Christ in union with, and at the school of, his Most Holy Mother. To recite the Rosary is nothing other than to contemplate with Mary the face of Christ. As a way of highlighting this invitation, prompted by the forthcoming 120th anniversary of the aforementioned Encyclical of Leo XIII, I desire that during the course of this year the Rosary should be especially emphasized and promoted in the various Christian communities. I therefore proclaim the year from October 2002 to October 2003 the Year of the Rosary. 15. Christian spirituality is distinguished by the disciple's commitment to become conformed ever more fully to his Master (cf. Rom 8:29; Phil 3:10,12). The outpouring of the Holy Spirit in Baptism grafts the believer like a branch onto the vine which is Christ (cf.Jn 15:5) and makes him a member of Christ's mystical Body (cf.1Cor 12:12; Rom 12:5). This initial unity, however, calls for a growing assimilation which will increasingly shape the conduct of the disciple in accordance with the “mind” of Christ: “Have this mind among yourselves, which was in Christ Jesus” (Phil 2:5). In the words of the Apostle, we are called “to put on the Lord Jesus Christ” (cf. Rom 13:14; Gal 3:27). 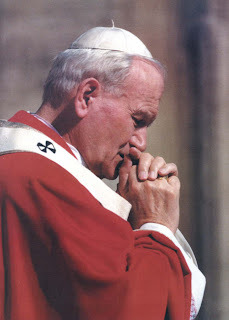 I believe, however, that to bring out fully the Christological depth of the Rosary it would be suitable to make an addition to the traditional pattern which, while left to the freedom of individuals and communities, could broaden it to include the mysteries of Christ's public ministry between his Baptism and his Passion. In the course of those mysteries we contemplate important aspects of the person of Christ as the definitive revelation of God. Declared the beloved Son of the Father at the Baptism in the Jordan, Christ is the one who announces the coming of the Kingdom, bears witness to it in his works and proclaims its demands. It is during the years of his public ministry that the mystery of Christ is most evidently a mystery of light: “While I am in the world, I am the light of the world” (Jn9:5). 20. The first five decades, the “joyful mysteries”, are marked by the joy radiating from the event of the Incarnation. This is clear from the very first mystery, the Annunciation, where Gabriel's greeting to the Virgin of Nazareth is linked to an invitation to messianic joy: “Rejoice, Mary”. The whole of salvation history, in some sense the entire history of the world, has led up to this greeting. If it is the Father's plan to unite all things in Christ (cf.Eph 1:10), then the whole of the universe is in some way touched by the divine favour with which the Father looks upon Mary and makes her the Mother of his Son. The whole of humanity, in turn, is embraced by the fiat with which she readily agrees to the will of God. The final two mysteries, while preserving this climate of joy, already point to the drama yet to come. The Presentation in the Temple not only expresses the joy of the Child's consecration and the ecstasy of the aged Simeon; it also records the prophecy that Christ will be a “sign of contradiction” for Israel and that a sword will pierce his mother's heart (cfLk 2:34-35). Joy mixed with drama marks the fifth mystery, the finding of the twelve-year-old Jesus in the Temple. Here he appears in his divine wisdom as he listens and raises questions, already in effect one who “teaches”. The revelation of his mystery as the Son wholly dedicated to his Father's affairs proclaims the radical nature of the Gospel, in which even the closest of human relationships are challenged by the absolute demands of the Kingdom. Mary and Joseph, fearful and anxious, “did not understand” his words (Lk 2:50). In these mysteries, apart from the miracle at Cana, the presence of Mary remains in the background. The Gospels make only the briefest reference to her occasional presence at one moment or other during the preaching of Jesus (cf. Mk 3:31-5; Jn 2:12), and they give no indication that she was present at the Last Supper and the institution of the Eucharist. Yet the role she assumed at Cana in some way accompanies Christ throughout his ministry. The revelation made directly by the Father at the Baptism in the Jordan and echoed by John the Baptist is placed upon Mary's lips at Cana, and it becomes the great maternal counsel which Mary addresses to the Church of every age: “Do whatever he tells you” (Jn2:5). This counsel is a fitting introduction to the words and signs of Christ's public ministry and it forms the Marian foundation of all the “mysteries of light”. 24. The cycles of meditation proposed by the Holy Rosary are by no means exhaustive, but they do bring to mind what is essential and they awaken in the soul a thirst for a knowledge of Christ continually nourished by the pure source of the Gospel. Every individual event in the life of Christ, as narrated by the Evangelists, is resplendent with the Mystery that surpasses all understanding (cf. Eph 3:19): the Mystery of the Word made flesh, in whom “all the fullness of God dwells bodily” (Col 2:9). For this reason theCatechism of the Catholic Church places great emphasis on the mysteries of Christ, pointing out that “everything in the life of Jesus is a sign of his Mystery”. (30) The “duc in altum” of the Church of the third millennium will be determined by the ability of Christians to enter into the “perfect knowledge of God's mystery, of Christ, in whom are hidden all the treasures of wisdom and knowledge” (Col 2:2-3). The Letter to the Ephesians makes this heartfelt prayer for all the baptized: “May Christ dwell in your hearts through faith, so that you, being rooted and grounded in love, may have power... to know the love of Christ which surpasses knowledge, that you may be filled with all the fullness of God” (3:17-19). 33. This is the most substantial element in the Rosary and also the one which makes it a Marian prayer par excellence. Yet when the Hail Mary is properly understood, we come to see clearly that its Marian character is not opposed to its Christological character, but that it actually emphasizes and increases it. The first part of the Hail Mary, drawn from the words spoken to Mary by the Angel Gabriel and by Saint Elizabeth, is a contemplation in adoration of the mystery accomplished in the Virgin of Nazareth. These words express, so to speak, the wonder of heaven and earth; they could be said to give us a glimpse of God's own wonderment as he contemplates his “masterpiece” – the Incarnation of the Son in the womb of the Virgin Mary. If we recall how, in the Book of Genesis, God “saw all that he had made” (Gen 1:31), we can find here an echo of that “pathos with which God, at the dawn of creation, looked upon the work of his hands”. (36) The repetition of theHail Mary in the Rosary gives us a share in God's own wonder and pleasure: in jubilant amazement we acknowledge the greatest miracle of history. Mary's prophecy here finds its fulfilment: “Henceforth all generations will call me blessed” (Lk 1:48). As a counting mechanism, marking the progress of the prayer, the beads evoke the unending path of contemplation and of Christian perfection. Blessed Bartolo Longo saw them also as a “chain” which links us to God. A chain, yes, but a sweet chain; for sweet indeed is the bond to God who is also our Father. A “filial” chain which puts us in tune with Mary, the “handmaid of the Lord” (Lk 1:38) and, most of all, with Christ himself, who, though he was in the form of God, made himself a “servant” out of love for us (Phil2:7). The Rosary is by its nature a prayer for peace, since it consists in the contemplation of Christ, the Prince of Peace, the one who is “our peace” (Eph 2:14). Anyone who assimilates the mystery of Christ – and this is clearly the goal of the Rosary – learns the secret of peace and makes it his life's project. Moreover, by virtue of its meditative character, with the tranquil succession of Hail Marys, the Rosary has a peaceful effect on those who pray it, disposing them to receive and experience in their innermost depths, and to spread around them, that true peace which is the special gift of the Risen Lord (cf. Jn14:27; 20.21). 43. Dear brothers and sisters! A prayer so easy and yet so rich truly deserves to be rediscovered by the Christian community. Let us do so, especially this year, as a means of confirming the direction outlined in my Apostolic Letter Novo Millenio Ineunte, from which the pastoral plans of so many particular Churches have drawn inspiration as they look to the immediate future. May this appeal of mine not go unheard! At the start of the twenty-fifth year of my Pontificate, I entrust this Apostolic Letter to the loving hands of the Virgin Mary,prostrating myself in spirit before her image in the splendid Shrine built for her by Blessed Bartolo Longo, the apostle of the Rosary. I willingly make my own the touching words with which he concluded his well-known Supplication to the Queen of the Holy Rosary: “O Blessed Rosary of Mary, sweet chain which unites us to God, bond of love which unites us to the angels, tower of salvation against the assaults of Hell, safe port in our universal shipwreck, we will never abandon you. You will be our comfort in the hour of death: yours our final kiss as life ebbs away. And the last word from our lips will be your sweet name, O Queen of the Rosary of Pompei, O dearest Mother, O Refuge of Sinners, O Sovereign Consoler of the Afflicted. May you be everywhere blessed, today and always, on earth and in heaven”. (4) Particularly worthy of note is his Apostolic Epistle on the Rosary Il religioso convegno(29 September 1961): AAS 53 (1961), 641-647.